Whether for weavers at the handloom, labourers at the plough, or factory workers on the assembly line, music has often been a key texture in people’s working lives. 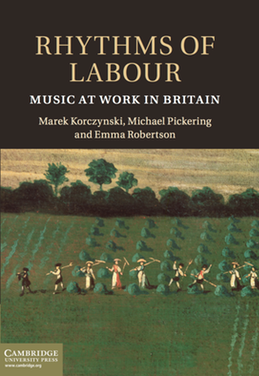 This book is the first to tell the rich history of music at work in Britain. It charts the journey from the singing cultures of pre-industrial occupations, to the meaning and uses of the factory radio, via the silencing effect of industrialisation. The first part of the book shows how widespread cultures of singing at work were in pre-industrial manual occupations. The analysis takes folk song out of the evening clothes in which song collectors had dressed it, and puts it back into its working clothes. The second and third part of the book show how musical silence reigned with industrialisation, until the carefully controlled reintroduction of Music While You Work in the 1940s. Continuing the analysis to the present day, the book shows how workers have clung to and reclaimed popular music on the radio in desperate, but also creative ways. By uncovering the hidden history of music at work, Rhythms of Labour offers new ways to think of music, and to think of work. In November 2013, Marek Korczynski gave a musical lecture based on the book at the Impakt Festival in Utrecht, Holland.